Electrophoresis, Gel Tanks and Power Supplies for SDS PAGE and Agarose Gels are now available at Pipette.com. Electrophoresis, Gel Tanks and Power Supplies from Labnet, Benchmark and MTC-Bio are available to meet your varied needs and requirements. Electrophoresis, Gel Tanks and Power Supplies available here are reliable and efficient for accurate and repeatable results and long product lifespan. Different Electrophoresis, Gel Tanks and Power Supplies have different benefits and uses. Click on the individual Electrophoresis, Gel Tanks and Power Supplies below to find out more details on each, or check out the Electrophoresis, Gel Tanks and Power Supplies spotlight products. The Benchmark Accuris myGel Mini Electrophoresis System is ideal for personal use, small laboratories or the classroom. This gel box/power supply combination is compact and easy to use. The Benchmark Accuris myGel Mini Electrophoresis System includes all the equipment that you need to get up and running - gel tank, power supply and two casting sets. Includes: gel box, safety lid, power supply, two 1.5 x 6 cm and four 5 x 6 cm gel trays, casting stands for gel trays and two double-sided combs for each gel size. Smaller tooth combs compatible with multichannel pipettes. The power supply connects to the gel box. 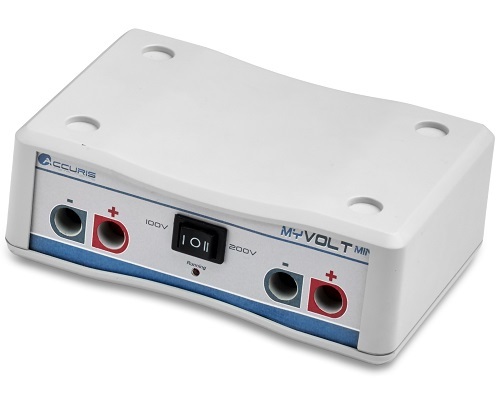 Selectable parameters: 35 V, 50 V and 100 V.
0-99 minutes or continuous timer. 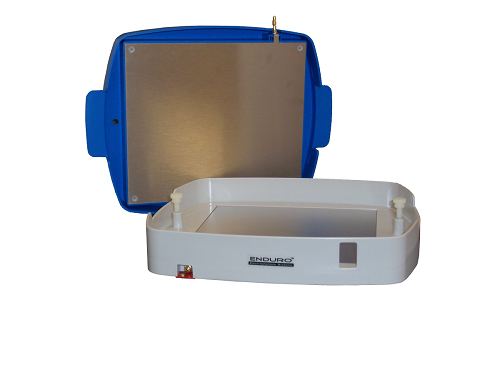 Vented, clear safety lid dissipates heat generated during electrophoresis. Dark contrast strip on tray helps visualize wells when loading. 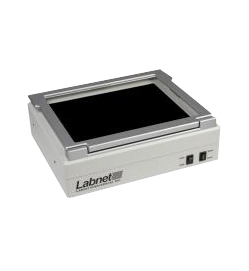 Labnet ENDURO Electrophoresis Power Supplies are ideal for DNA, RNA and protein electrophoresis as well as blotting. 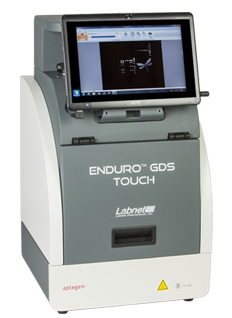 Labnet ENDURO Electrophoresis Power Supplies provide a high degree of sophistication and versatility yet are extremely easy to use. 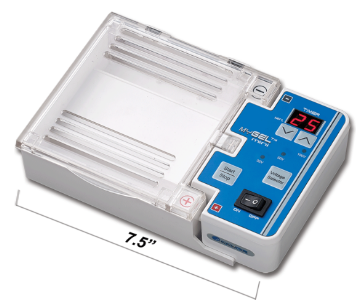 Two models of the Labnet ENDURO Electrophoresis Power Supplies are available to meet a variety of user needs. They offer dependable performance, intelligent control, simple programing, current or wattage adjustability and a compact and lightweight stackable design. Dependable performance and intelligent control. Constant voltage, current or wattage. Compact, lightweight and stackable units. Ideal for personal use, small laboratories or the classroom, this gel box/power supply combination is compact and easy to use. 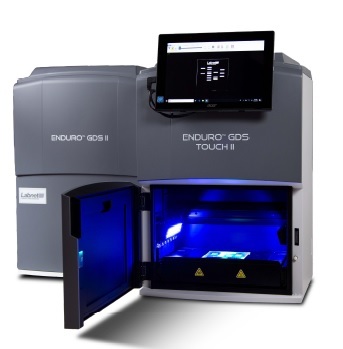 The Benchmark Accuris myGel Mini electrophoresis system includes all of the equipment that you need to get up and running - gel tank, power supply and two casting sets. 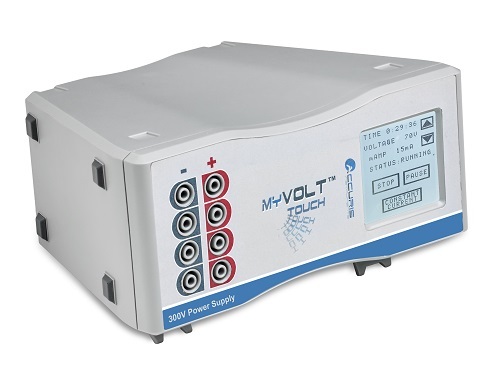 The Accuris myVolt Mini is a compact electrophoresis power supply ideal for basic, constant voltage applications. Labnet Gel XL Ultra V-2 Complete Electrophoresis System, Includes Gel Tank With Safety Lid, Direct-connect Power Supply And Standard Casting Set E0145A. New version: 7 voltage choices from 18V to 135V. Complete and compact. Intelligent direct connect power supply. Safety lid interlock system. UV transparent gel tank and gel trays. Multichannel compatible combs. Blotting boxes available in clear and light-blocking opaque black for light sensitive samples. A modular system allowing PAGE, electroblotting and 2D gel electrophoresis to be carried out in the same tank, simply by changing the inserts. Users can purchase only the parts they need, or a complete combined system for a cost saving over buying all three systems separately. Quick and easy set up with a wide range of accessories. ENDURO Semi-Dry Blotter is one of the best choices for your Western, Southern, and Northern blotting protocols. Do you need agarose for gels too?